Homo Naledi – a racist plot? – Now Look Here! If you don’t follow science news, you may not be aware that scientists have recently announced the discovery of a new human species in The Cradle of Humankind in South Africa. This hominid, homo naledi, is a totally new discovery, that challenges a lot of what we thought we knew about human evolution. This is what scientists call a “good thing”. 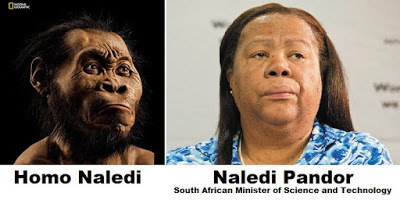 Now it turns out that the Minister of Science and Technology in South Africa is a woman named Naledi Pandoor, so it didn’t take long for somebody to find a particularly unflattering file photo of Ms Pandoor and stick it next to an artist’s representation of how homo naledi might have appeared. It was passed around on facebook for a while, we all had a quick chuckle, and then got on with looking at cat pictures. Or so I thought, having assumed (as one does) that everybody on earth thinks exactly as I do. I have to agree with Motshekga – this story that my ancestors were baboons does not sit well with me. Have any body seen a baboon my height? He was referencing earlier comments by other government leaders, laughing off the very idea that anybody could expect them to believe that their ancestors were baboons, or monkeys. It turns out that many of our leaders not only prefer the bible’s version of the origins of our species, but decry the entire theory of evolution as a vicious racist lie. So what’s going on here? Why would intelligent adults say such things? Where on earth are they getting the “Racist” angle from? According to my circle of facebook friends, it’s just more proof that our appointed leaders are a bunch of fools, and that it’s time to change the government and… well I get bored reading the same old statements made by the same old people every single day in response to every single act of state so I don’t know how it ends. But let’s step back a bit and try to figure this out for ourselves. Rather than condemning them as idiots, let’s try to understand where they are coming from. Let’s try to put ourselves in somebody else’s shoes for a moment. The moment we do that, it turns out to be rather easy to figure out. First, and most obviously, the ANC has a long history of Christianity, whatever the actions of their current leaders might attest, or the anti-communist propaganda of the previous regime might have claimed. Many Christians write off those parts of science that appear to contradict biblical teachings, so we already have part of the answer. But what should be equally obvious is this: They are black. Black people in South Africa, especially those old enough to be in top government positions, endured many decades of being told exactly why they were inferior to whites. They suffered being called endless names, including the still-popular “Baboon”. And one of the favourite arguments, used by pseudo-intellectuals across the nation, was evolution. “You must understand”, they say, “That these blacks are less evolved than us.” They go on to point out a number of meaningless physical differences, explain how the fact that the different races have developed minor differences in structure means that one group is more “highly evolved”, more human, than the other. Utter garbage, of course, since that’s not how natural selection works at all. But most people don’t understand Evolution at all, so if you’re already inclined to think less of other races, this nonsense can easily make sense. Simplified scheme of human evolution. There is this idea that evolution is a progression, and that on one end we have primitive inferior organisms, and on the other we have the elite superior humans, and that every living thing has to fall somewhere between the two. Every time some hollywood villain justifies his crimes by invoking natural selection or “Survival of the fittest”, this idea settles a little deeper in our minds. Every time we show somebody that famous “Ascent of Man” diagram with the various primates arranged by height, we reinforce the misconception. And when we talk about Africa as the birthplace of humanity and show how non-africans migrated around the world, and point to where the different races settled… well, you can see where this is going. So it’s no wonder that people who have been the victims of racism aren’t going to have an open mind here. Distorted versions of these ideas have been used countless times to put them down, to remind them of their place, and to justify horrible policies against them. How do you set somebody straight without telling them, effectively, that “Nobody is saying racist things about you, you’re just imagining it” when everybody involved knows that far too many people are saying exactly those things every day? How do we differentiate between real science and apartheid pseudoscience, without appearing to say “I’m not a racist, but…”? Perhaps all we can do is keep talking softly, talk about what the basics of evolution actually are, and hope that it filters through into enough people to make a difference. Point out that while race is a very real and powerful social factor, it has no physical meaning. Highlight the fact that different races are able to interbreed and explain that this shows that we are all still the same species. The fact that different races have minor adaptations to suit the geographies where they formed doesn’t mean that they are evolved at different levels, because there are no levels in evolution. And be very, very careful to avoid racially or emotionally loaded phrases, especially those that seem innocent to us but are full of meaning to our audience. Oh, one more thing: It needs to be said that I’m talking about a specific case of black people in South Africa not believing. I’m well aware that those who reject established scientific knowledge are not limited to any particular race or location. The debate on twitter that I mentioned was fought most vehemently between young black scientists and old black politicians. And as any fool knows, conservative whites in America are really big on the whole “Evolution is a lie propagated by Satan” thing. I guess that’s just another thing we all have in common.